Japanese Sake is an alcoholic drink made of fermented rice, koji and water. Nanbu Bijin uses the original sake rice, “Gin Ginga” and “Gin Otome”, which was co-developed with Iwate municipal government and Iwate Sake Makers Association and Iwate industrial research institute, Japan. We grow the original sake rice, “Gin Ginga”, only cultivated in northern part of Iwate, Japan. Using special techniques, 100% of “Gin Otome” cultivated in Ninohe city is used for Nanbu Bijin. For making local sake, local made rice should be used. We are happy to hear that this concept is widely accepted and commit to accelerate. Once cultivated, the rice is polished to remove the bran, which includes several harmful ingredients for sake brewing, such as fats, proteins, ash-content and vitamins. Rice-polishing ratio for normal is about 90%, it means to get rid of only remain 10% in total. 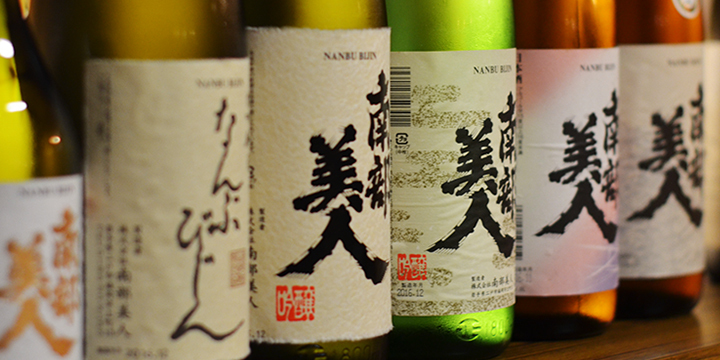 However, the ratio for Nanbu Bijin is 70% and even 35% for DaiGinjo, our top level quality. We wash rice 2 ways: by hands using basket, it is for high level top quality, “DaiGinjo”, Rice-polishing ratio 35 to 40 %, or by bubbled water jetting device. After soaks into fresh water and cuts of water, water absorption rate could be calculated by comparing with the weights b/w before and after soaks. These methods are called “limited absorption”, it is not until when rice soaks its core, but till when rice soaks to some extents to pull up. Bubbled water washing device: It is new way of washing rice, starts to deploy from 2011. We have deployed this method for all sake but top level quality, “DaiGinjo”. This method is widely deployed by famous Sake breweries in Japan, mainly in Tohoku region, it is one of the best way to wash rice. Sake rice needs to be steamed. Normally we wash rice. Then, we pure water and switch on the rice cooker. However, in case of sake rice, we wash sake rice. Then, we steamed it by using something like bamboo steamers. One hour later, we use dedicated scope to dig up the rice. The steamed rice has nearly 100 degrees close temperature. The way of viewing the condition of steamed rice is called “Hineri Mochi”.